Our kitchen smells like buttery toasty garlic-y basil. Tonight at 8:15 p.m. I was so tired I had contemplated going to bed when I recalled a phone call from my younger daughter a few days earlier. And so the discussion about pine nuts and parmesan began. So I was sitting there, recalling that discussion about pine nuts and parmesan and looked over at her. She’s been living with us since July and I really haven’t had that many meal preps in the kitchen with her. I felt like I wanted to bond. To create our own “farm to fork” night right in my kitchen. The basil in my garden is almost waist high. The timing was now. My heart smiled and my legs pushed me out of my comfy chair. Before long the entire island was covered with parts of a food processor, garlic infused oil she had brought from California a few months earlier, loads of sweet smelling basil, and her groceries. 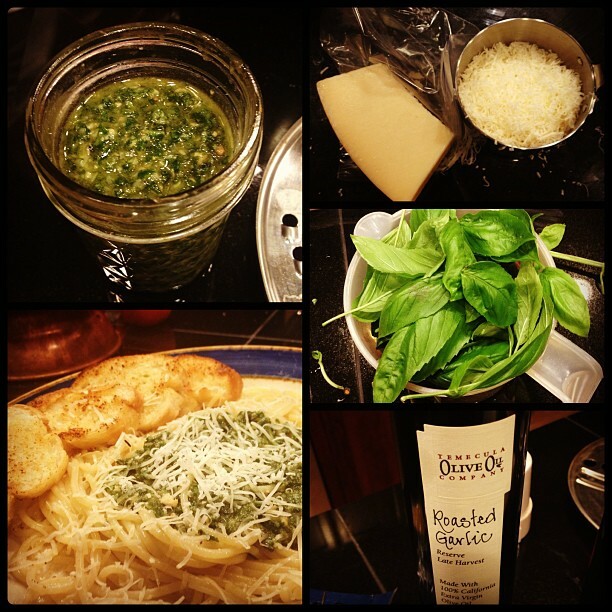 We deleafed basil, shredded cheese, measured ingredients, chopped, and presto! Or, should I write…PESTO!? The oily, complex flavor was delicious. But the time in my kitchen with my daughter working by my side was even better.